Product: This is a car set consisting of two HSB type Rf4 roller cars as they are still presently used on the lines in the Harz Region. The paint and lettering are prototypical for Era VI. The middle part of the car floor is constructed of die-cast zinc so that the car has sufficient weight to run safely unloaded. Chock blocks can be swung out and are adjustable. Retaining brackets included with the set also allow you to load normal LGB cars with a gauge of 45 mm / 1-3/4". 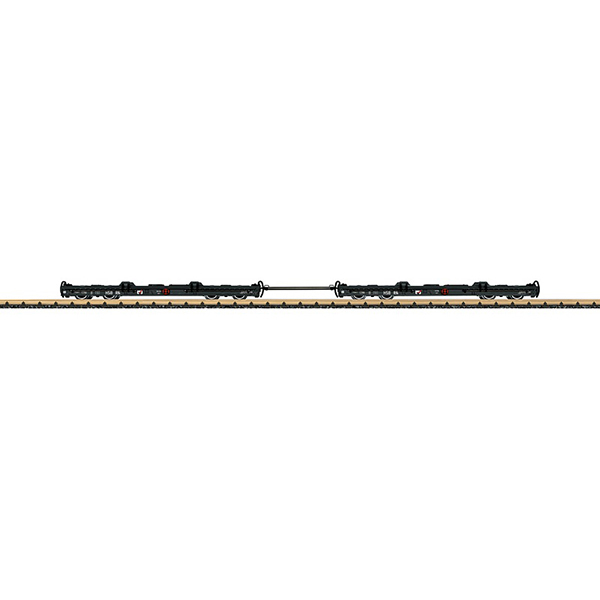 The roller cars are coupled prototypically together and to a locomotive or car with a normal LGB coupler by using the coupling drawbars included with the set. The cars have metal wheel sets. Length of a car 34 cm / 13-3/8". This car is the ideal add-on for the 20301 locomotive.